Oh Look! The Dogcow had puppies over the holidays! That's so CUTE! The idea for this painting came to me yesterday, I was thinking about how the Dogcow paintings seemed to be multiplying. I believe the painting turned out cute as a button! This painting has a definite sense of humour, it's a JoT comic in itself. Let me explain the artwork in plain, art speak; "it's the unified muliplication of the anthropromorphilized rendering of black and white space". 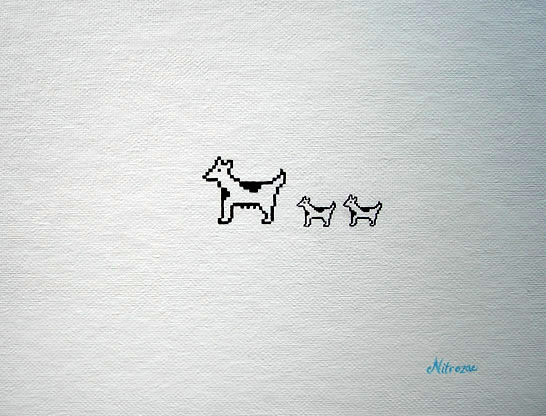 In other words; "it's Mommy Dogcow and her babies going for a walk in a field of white pixels." How sweet is that? You must adopt this painting. It's that simple.